This 8,450 s.f. 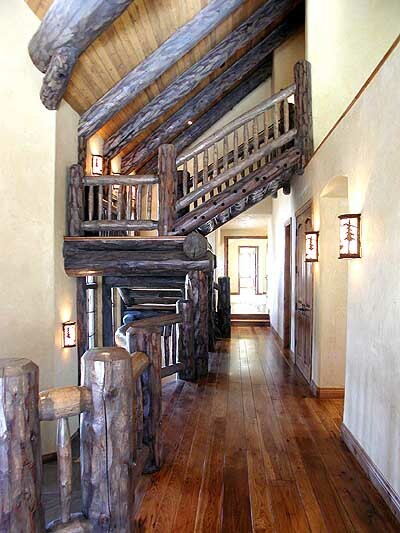 speculative log home is located at the recently developed Arrowhead Mountain Estates on Beaver Creek Mountain, Colorado. Named after the former ski run it sits on, Lone Pine Lodge is designed to take advantage of both site and lifestyle. The main level features a great room, walk-out patio with outdoor fireplace, and views to the south, west, and north through a mix of aspen and evergreen forest. The great room consists of two seating areas each with their own fireplace, a dining area and kitchen. There is a large covered deck adjacent to the north sitting and dining areas. The spacious kitchen with adjacent breakfast nook are south facing with access to an expansive patio. The master suite, with separate his and hers baths, large steam shower and exercise area, has views to the north, south, and east with access to the south facing patio. A study is located adjacent to the master bedroom and also has patio access. A primary guest bedroom with a secondary master bathroom is located above the main level and has views to the north and south. A theater, family room with bar and wine room, three bedrooms each with separate bath, laundry, mud and ski room, and the three car garage are all located on the lower level. The family room and all bedrooms at this lower level have outdoor patio access. Click here to go to the Exteriors.